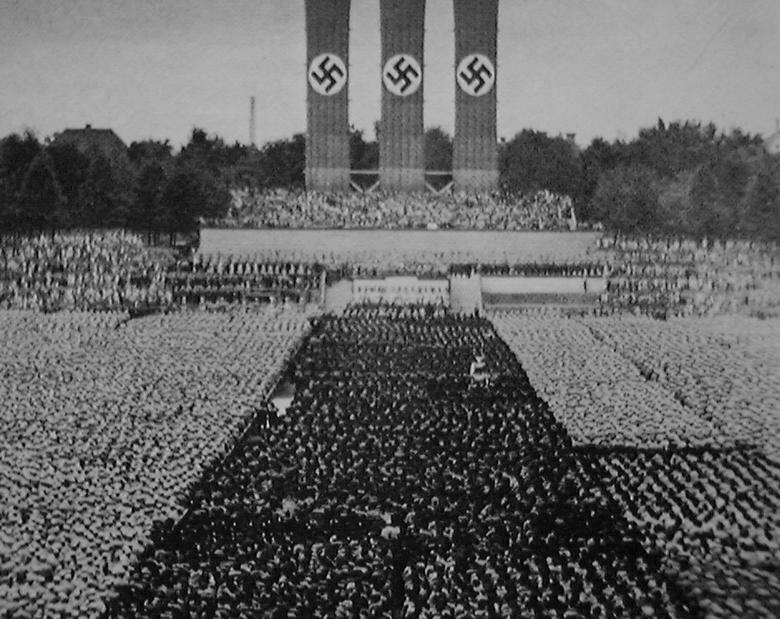 The ghost of Tannhäuser haunts the opening scenes of Leni Riefenstahl’s hyper-real document of the 1934 Nuremberg rally. The surging rhythms and melodic leaps from Wagner’s great overture are intertwined within Herbert Windt’s blustery score. Ironic, perhaps, that the theme for the Goddess of Love should here soundtrack the entrance of the high priest of hate. Shortly afterwards, we hear something that at first we might mistake for the Internationale – of course, it’s not. But the resemblance is typical of the way the National Socialist regime appropriated motifs from the International Socialist Movement. Later on, the manner in which the front ranks of the crowd will speak in unison was, in the words of Siegfried Kracauer, an ‘outright imitation of communist propaganda methods’. It is tempting to see in Herbert Windt’s diffuse and oleaginous appropriation of popular themes and classical allusions some sort of articulation of a distinctly Nazi aesthetic – the analogue in many respects to their rhetoric. But Wagnerian motifs and Straussian harmonies were as common to pre-Nazi German cinema as they were to Hollywood films before and after the war. What Triumph of the Will‘s music lacks, of course, is the element of doubt and uncertainty introduced by the influence of Schoenberg’s twelve-tone system on many Hollywood composers. Nonetheless, in its jingoistic heroism, and the peculiarly thin, under-composed feel much of the music reveals on closer examination, Windt’s style finally recalls none other than John Williams. It is a fact remarked on by Mervyn Cooke in his recent History of Film Music, that many of Windt’s themes and fanfares would not sound out of place in Star Wars. I don’t usually comment on old articles but this by Robert Barry is such a load of old twaddle it deserves some response. This is the usual reviewer’s technique engaged when approaching any material from the Third Reich period – oh it’s Nazi so one cannot be seen to write anything favourable about it. There are many essays written about Triumph Des Willens and its influence on all forms of cinema, from the obvious party political broadcast to Star Wars. Part of that influence is in its use of soundtrack. The feeble bombast on offer here is undoubtably Barry’s, certainly not Windt’s. What a curious comment you make. As far as I can gather you are commenting only on the title and not on the article itself. Your argument against my criticisms of the film seems to be that it was influential – notably on star wars. however isn’t the soundtrack’s influence on star wars precisely the point i am making in my last paragraph? so… everything i say is twaddle – and you can prove this by repeating the same twaddle as your own argument. interesting strategy there Steve.